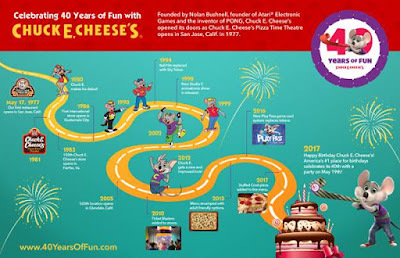 Mail4Rosey: Chuck E Cheese is Celebrating their 40th Birthday with Free Cake and More! 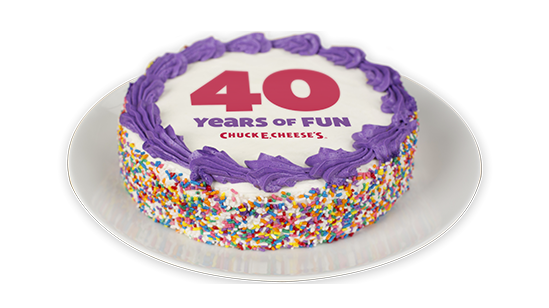 Chuck E Cheese is Celebrating their 40th Birthday with Free Cake and More! Disclosure: This is a sponsored post. All opinions stated are my genuine Chuck E. Cheese loving own. Happy Birthday to Chuck E Cheese!! Today they are celebrating 40 years of awesomeness, and you are invited to the party! Tonight, May 19th, participating locations around the country will be celebrating this big birthday milestone in style. Help them attempt to break a Guinness World Record title for the most birthday blowers blown simultaneously. That's right, you can help be a part of an attempt to set a world record! There will also be free birthday cake while supplies last, 40 free tickets with a minimum $5 purchase and birthday blowers too. It all takes place at 7:40 p.m. CST/8:40 pm EST. Almost every kid likes to party down at Chuck E Cheese, and there's a good reason for it. Jam-packed with games and other awesome things to do, like their big signature winding play area with a slide, it provides a fun place for kids to let loose in a safe setting, and have a ton of fun doing it too! The first Chuck E Cheese's store opened in 1977 in San Jose, CA. Since then, the iconic family entertainment brand has made numerous changes, including adding new, more adult-friendly menu items but remains America's number one place for birthdays. Most recently, Chuck E Cheese's launched a program for children and families impacted by autism called Sensory Sensitive Sundays. Tonight's the Night! Head on over to Chuck E. Cheese's and help them celebrate their big 4-0! Seems like it's been around forever. Going to be very noisy tonight. Big 4-0 is a milestone indeed. And free cake can be a win for many a bin. This is such a fun place for kids. I spent a lot of time there when my son was small. Lots and lots of birthday parties. That is awesome! Chuck E Cheese is an American institution. It's been so much fun for so many kids for so many years. Free cake! Happy birthday to Chuck E Cheese, AND to the rest of us! Point 1) I had no idea Chuck E Cheese was that old. For some reason, I thought they only came about in the 90's. Point 2) Holy crap! New mouse-avatar! Cool. I wish I had been able to see this earlier. I am sure it would have been a lot of fun. Happy Birthday to Chuck E. Cheese! Seems like they have been around forever but had no idea just how long. Cant believe... 40! That is awesome! I LOVE Chuck E. Cheese! This is usually where we go to celebrate our kids' birthdays. They absolutely love it! Plus, Chuck E. always makes an appearance! I can't believe its been that long! OMG. 40 years! We love Chuck E Cheese! So many birthdays have been celebrated there, so many after-game meals, and so many "just because" trips to our favorite fast food chain! We have to go and help them celebrate! Looking good for 40! I loved going there as a kid, and now I'm happy to take my kids there. My boys used to love to go there every summer when they were younger. Omg Chuck E Cheese has been around for 40 years? Wow thats amazing and this was a cool campaign to break a world record! My kids love going there and it's awesome that they have so much to offer! I think it's nice that they're celebrating 40 years! I didn't know they were around for that long! Free cake does sound good! I thought about taking the boys to Barnes and Noble for Isaak's birthday treat. Who can resist games and free cake? we need to go again soon. Might plan that now, since you reminded me! Water is Even More Fun with COOP Sports! Snuggle Plus SuperFresh has Odor Eliminator! Wishing All the Moms an Awesome Day! Boston Market: Dinner Deals for Mom! Shopping for the Mom Who Has Everything! Wild Eye Designs for Mothers Day This Year!